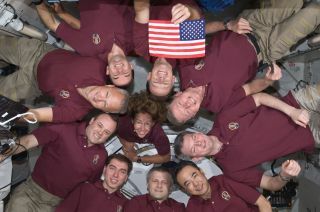 In an occurrence which became somewhat of a tradition for shuttle crews and those of the International Space Station expeditions, the Expedition 28 crew and the STS-135 Atlantis astronauts formed a microgravity circle for a portrait aboard the orbiting complex's Kibo laboratory of the Japan Aerospace Exploration Agency. This image was taken on July 15, 2011 during NASA's final shuttle mission STS-135 aboard Atlantis. HOUSTON – The space shuttle Atlantis' four astronauts will enjoy some time off today (July 17) after finishing unpacking the cargo the orbiter brought up to the International Space Station. The spaceflyers have spent more than a week moving nearly five tons of cargo onto the station from a giant space locker called the Raffaello module and the shuttle Atlantis' mid-deck. The Raffaello cargo pod is also being refilled with trash and broken or obsolete hardware that will be returned to Earth at the end of Atlantis' mission. Today will be the last full day of cargo transfer work before the Raffaello module, which was temporarily attached to the Earth-facing port of the space station's Harmony node earlier in the mission, is robotically re-installed inside Atlantis' payload bay. "We're at about 94 percent complete," flight director Courtenay McMillan said of the packing job on Saturday night. "What's left to do is basically finish packing [the shuttle] up." Commander Chris Ferguson, pilot Doug Hurley, and mission specialists Sandra Magnus and Rex Walheim launched toward the International Space Station on July 8, and arrived at the massive orbiting complex two days later. The enormous amount of cargo delivered by Atlantis will help keep the station operating through 2012. Yesterday (July 16), Atlantis' astronauts conducted a special ceremony that paid tribute to the history of the space shuttle program and the future of American human spaceflight. Ferguson presented a historic U.S. flag that flew on the very first shuttle mission — the STS-1 flight of the shuttle Columbia — to the six-person station crew. The flag is a symbol that the United States will continue to have a presence in space beyond the shuttle program, with astronauts continuing to live and work onboard the space station. Ferguson said the flag will remain on the station until American astronauts are once again launched to the space station from U.S. soil. That future crew will return the flag to Earth, until it is once again brought into space when the first crew from the United States journeys beyond Earth orbit. In a phone call from the White House, President Barack Obama spoke to the crew about the flag and its symbolism, and compared the challenge to a "capture the flag" moment for commercial spaceflight. NASA is retiring its 30-year space shuttle program to focus on exploration missions beyond low-Earth orbit, to destinations like an asteroid or Mars. Once the shuttle fleet is grounded for good, the agency will rely on commercial providers to deliver supplies, and eventually astronauts, to the International Space Station. You can follow SPACE.com Staff Writer Denise Chow on Twitter @denisechow. SPACE.com Senior Writer Clara Moskowitz contributed to this report. Visit SPACE.com for complete coverage of Atlantis' final mission STS-135 or follow us @Spacedotcom and on Facebook.